We walk down a narrow, dirty road, past people selling their handcrafts, past the large temple that only Hindus are allowed entrance to, and down by the Bagmati River. A cow wanders past, seemingly unaware of her god-status. Smoke rises into the air from burning bodies and the families of the deceased watch soberly, hoping that the soul of their loved one will find safe passage to it's next life. We continue on, past the houses where people come to die and across the old bridge. On the other side of the river now we make our way up steps and past small buildings that shelter various deities. We find ourselves in a grove of trees and are delighted to see monkeys - Momma monkeys carrying their young, and little playful monkeys making mischief. Huge butterflies and gossamer dragonflies flutter by in the clear air. Beyond the city loom snow covered mountains, the foothills of the majestic Himalaya. We come out of the trees now to the building that the Milk Baba calls home. We take off our shoes outside the door and step inside his small room. He's sitting there on a mattress atop the floor. 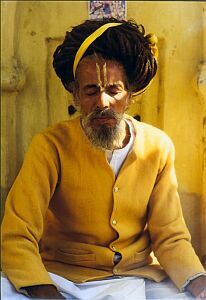 His long, long dreadlocks are wrapped elegantly around his head and tied with a strip of yellow cloth above the bright tika mark on his forehead. He is dressed all in white, and welcomes us graciously. Pictures of Hindu gods, many draped with tinsel garlands and strands of beads, cover the walls. There are also pictures of the Milk Baba in other countries where he has traveled at the invitation of his devotees. Most out of place in the wall decor is a very Catholic looking picture of the Virgin Mary. We sit down on the floor as he puts water on to boil on a small burner sitting in the middle of the floor. A Nepali woman in a pink sari sits in the corner with a small girl wearing a frilly dress. A young disciple plays tabla drums while the Milk Baba sings a hymn to Rama and Krishna. Someone tosses coins in through the open door. Gus has a question for the sadhu. "Devotion" is the Baba's reply. "To whom?" asks Gus. "Brahma? Krishna?" The Milk Baba throws tea leaves into the steaming water. "They are all the same. All gods take you to the same place." Fifty-two years of dreadlocks shift and he pushes them back into place, forward, toward the tika. Gus asks him to sing a simple song, one we can sing along with. Gus alone joins in this song to Shiva, the destroyer. The smell of tea fills the air. Gus explains to us that the Hindu deities are not really gods, merely representations of various aspects of the Supreme Being. So, he says, it wouldn't be a betrayal for us to sing to Shiva. We disagree. The woman in the corner nurses her child and a young boy brings cups for tea. I wonder if they've been washed in the river near where the bodies are burned. The Milk Baba pours steaming tea for us and the boy serves it. More money is tossed in and the sadhu discreetly tucks it between the floor and his mattress. We sip our tea and talk for a few minutes. It's time for us to be going now. We thank the Milk Baba and step outside, blinking in the bright sunshine. We find our shoes and walk away. Monkeys wash in the river. There are table full of carvings and statues of various Hindu gods. Go ahead and pick one. They're all the same. Across the river a new body, wrapped in saffron cloth, lies waiting to be burned. We spent hours, and days, with travelers like Gus, many of whom were asking the same question: what is the Path? Most of those were seeking the answer in the religions of the east. As we got to know them we shared our lives together: we crammed into traincars and rode rickshaws, ate curry and camped in the forest, we hiked mountains and rode elephants. As through all of those things we sought to point the way to the One who didn't just show us the path, but who is the Path. *Gus is not his real name. I could have read 8 more pages of what you shared here. I just feel peaceful reading your descriptions and almost living what you've writte. Thanks Rebecca.